Here an LED spot light from Seoul Semiconductor. 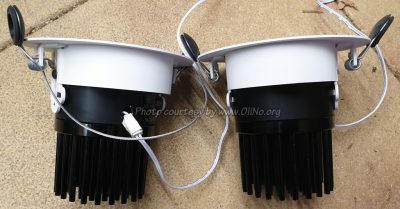 The measurements from OliNo show that the lamp emits a warm/neutral white light with a color temperature of 3963 K. The lamp consumes 15.1 W and has a luminous flux of 1645 lm. This results in an efficacy of 109 lm/W. The lamps energy category label is A+. This lamp is, wrt Blue Light Hazard, to be compared with a spot lamp with the Seoul Semiconductor Sunlike LED. At the end of this article the calculated results are presented. Also a specific measurement on Blue Light Hazard is done and the results are in the PDF downloadable from this article. This article shows the measurement results. Many parameters are also found in the Eulumdat file. See this overview for a comparison with other light bulbs. Luminous intensity Iv 1830.6 Cd Measured straight underneath the lamp. This is about the same value as the value of the same spot lamp but then fitted with a Seoul Semiconductor Sunlike LED chip. This must be the same in order to compare the Blue Light Hazard results between the two spots. Beam angle 62 deg 62 deg is the beam angle for the C0-C180-plane (perpendicular to the length direction of the lamp) and 60 deg is the beam angle for the C90-C270 plane, which is along the length direction of the lamp. Power P 15.1 W The net power consumed. Power Factor 1.00 The tests were done with a DC power supply. 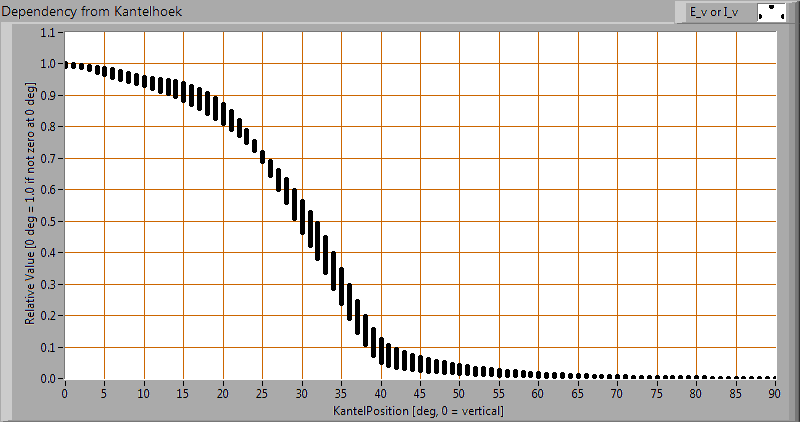 This results in no blind power and as a result the power factor is always 1.0 but not relevant to mention. THD NaN % Total Harmonic Distortion, is not present as a DC voltage was used to power the lamp so a DC current resulted which has no THD. Luminous flux 1645 lm Measured with photogoniometer, calculation done as described in LM79-08. Luminous efficacy 109 lm/W Be aware that a DC power supply has been used. The found efficacy with this measurement is excluding the power supply that normally is needed to convert the grid voltage (230 V AC) to the used DC voltage. By excluding the consumption of the power supply the efficacy found here is higher than it would be when the power supply had been included. EU2013-label classification A+ The energy class, from A++ (more efficient) to E (least efficient). This label is an update of the previous version, and compulsory from Sept 2013. CRI_Ra 84 Color Rendering Index. Rf_TM30 83 TM30-15 is an improved indicator (over CRI) of how well colors are rendered. 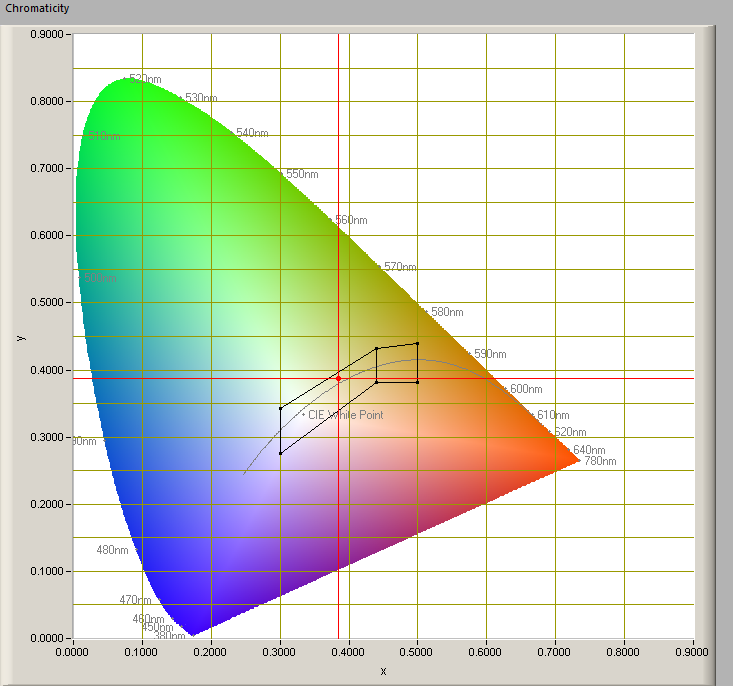 Rg_TM30 93 Gamut Area Ratio. Fitting DC A direct current has been put onto the LED spot light. PAR-photon efficacy 1.0 uMol/s/We The total emitted number of photons by this light, divided by its consumption in W. It indicates a kind of efficacy in generating photons. Photon current 23.9 uMol/s The total number of photons in the light of this lamp (over 350-750nm). 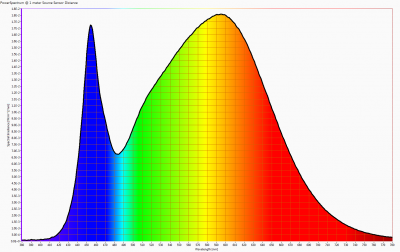 Luminous flux for chicken 2831 cLm Total radiant flux adjusted by color sensitivity curve (from 350 – 780 nm) of chickens (Gallus domesticus). S/P ratio 1.7 This factor indicates the amount of times more efficient the light of this light bulb is perceived under scotopic circumstances (low environmental light level). D x H external dimensions 135 mm x 117 mm External dimensions of the lamp. D luminous area 75 mm Dimensions of the luminous area (used in Eulumdat file).It is the surface of the reflector. General remarks The ambient temperature during the whole set of illuminance measurements was 24.1 – 25.2 deg C.
At the end of the article an additional photo. Eff-variation -1 % This is the variation in efficacy (calculated as indication by simply dividing the illuminance by the power) during the warming up. A very high negative value indicates a significant decrease for instance due to heating up of the lamp (decrease of lifetime). Dimmable yes Info from manufacturer. Melanopic effect factor 0.567 According to norm DIN SPEC 5031-100:2015-08. Blue Light Hazard risk group 0 0=exempt, 1=low, 2 = moderate, 3=high risk. Indication value only for straight underneath the lamp. Measurement report (PDF) In this report, specific Blue Light Measurements on the two spots have been done. The results correspond very well with the calculated results at the end of this article. Eulumdat file Right click on icon and save the file. IES file Right click on icon and save the file. Please note that this overview table makes use of calculations, use this data with care as explained on the OliNo site. Since Sept 2013 these labels will be needed. Important for the energy classification are the corrected rated power and the useful luminous flux. The measured rated power is 15.1 W and might need to be corrected. The correction is dependent from the lamp type and whether or not the lamp control gear is included or not. The choice for this lamp is the following classification: Lamps operating on external LED lamp control gear. As a result the corrected rated power becomes: 16.7 W.
The luminous flux measured is 1645 lm. The classification of this lamp needed to determine the useful flux is: Other directional lamps. Then the useful flux becomes 1579 lm. Now a reference power can be calculated. The energy efficiency coefficient is P_corr / P_ref = 0.14. The lamp’s performance in the lumen-Watt field, with the energy efficacy fields indicated. This light diagram below comes from the program Qlumedit, that extracts these diagrams from an Eulumdat file. The light diagram giving the radiation pattern. The light diagram indicates the beam in the C0-C180 plane (perpendicular to the length direction of the lamp) and in the plane perpendicular to that, the C90-C270 plane (along the length direction of the lamp). When using the Ev or Iv values per inclination angle, the beam angle can be computed, being 62 deg for the C0-C180 plane and 60 deg for the C90-C270 plane. Image of the light distribution pattern in 3D. Intensity data of every measured turn angle at each inclination angle. 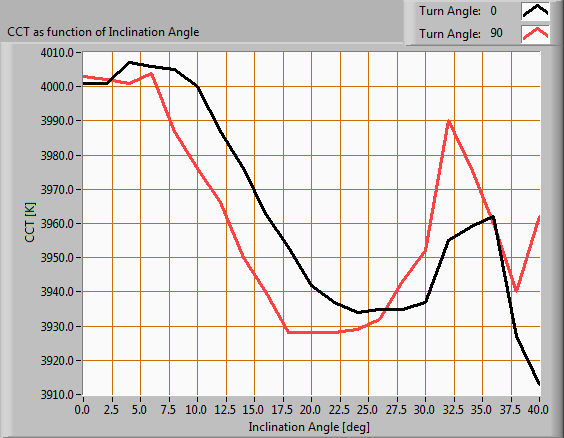 This plot shows per inclination angle the intensity measurement results for each turn angle at that inclination angle. There normally are differences in illuminance values for different turn angles. However for further calculations the averaged values will be used. 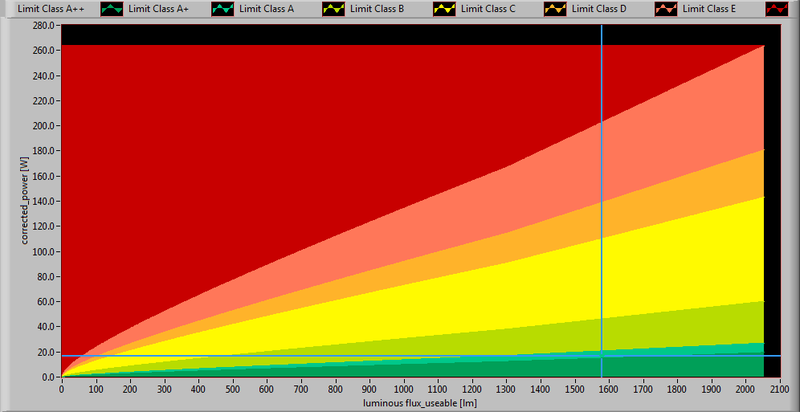 With the averaged illuminance data at 1 m distance, taken from the graph showing the averaged radiation pattern, it is possible to compute the luminous flux. The result of this computation for this light spot is a luminous flux of 1645 lm. The luminous flux being 1645 lm, and the consumed power of the lamp being 15.1 Watt, results in a luminous efficacy of 109 lm/Watt. The power factor is 1.00. The tests were done with a DC power supply. This results in no blind power and as a result the power factor is always 1.0 but not relevant to mention. 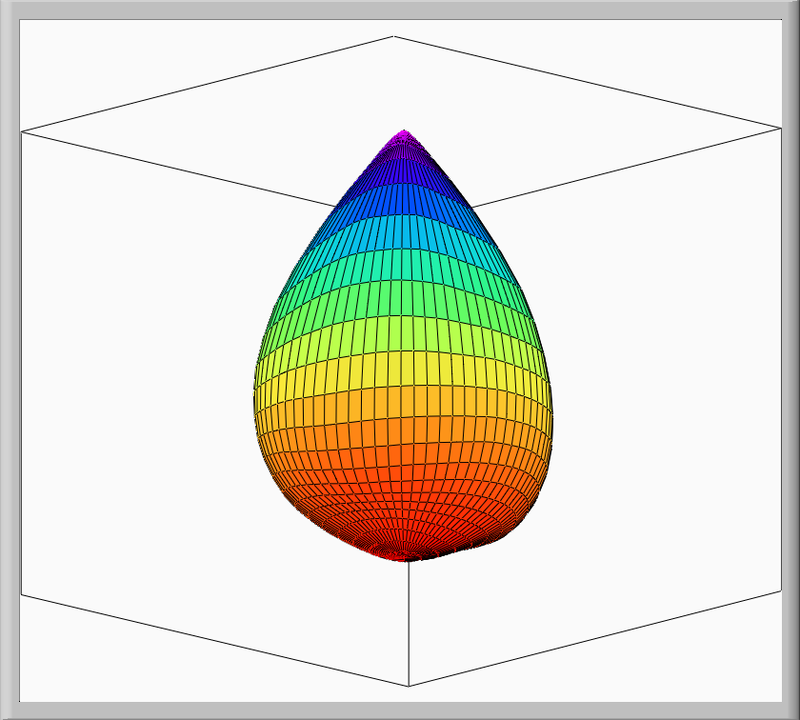 The spectral power distribution of this light bulb, energies on y-axis valid at 1 m distance. The measured color temperature is 3963 K which is warm/neutral white. This color temperature is measured straight underneath the light bulb. 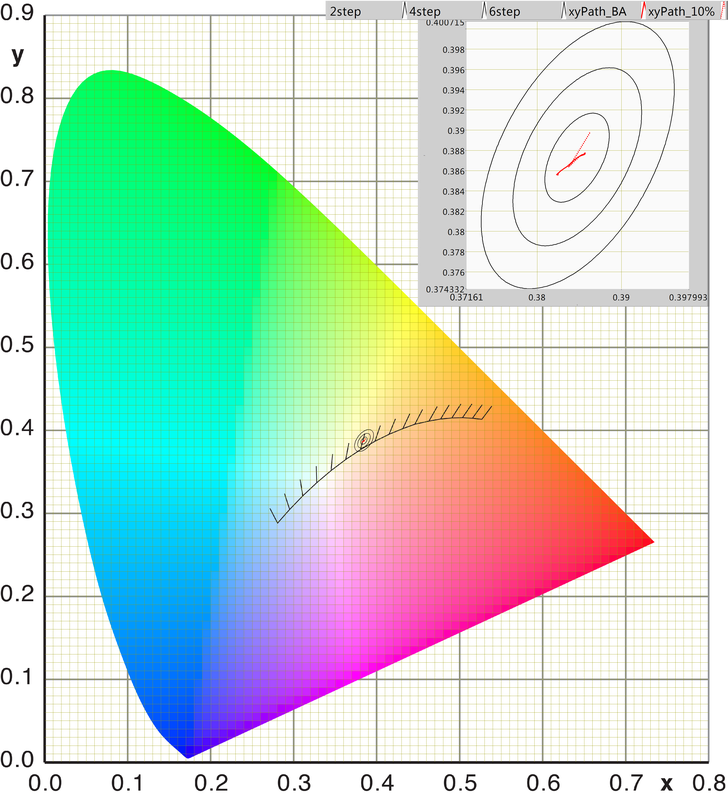 Below a graph showing the color temperature for different inclination angles. 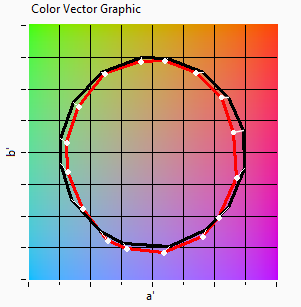 Color temperature as a function of inclination angle. The color temperature is given for inclination angles up to 40 deg. Beyond that value the illuminance is lower than 10%% of Ev straight underneath the lamp, that it has not been used for color determination of the light. For the C0-C180 plane: the beam angle of 62 deg is equivalent to 30.8 deg inclination angle,which is the area where most of the light falls within. The maximum variation of color temperature in this inclination area is about 2 %. 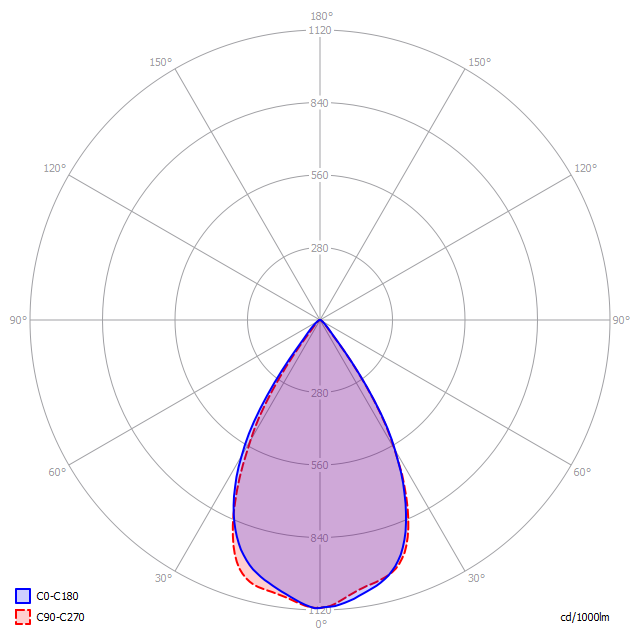 For the C90-C270 plane: the beam angle of 60 deg is equivalent to 30.0 deg inclination angle,which is the area where most of the light falls within. The maximum variation of color temperature in this inclination area is about 2 %. To make a statement how well the light of this light bulb is for growing plants, the PAR-area needs to be determined. The PAR efficiency is 64 % (valid for the PAR wave length range of 400 – 700 nm). This is the maximum percentage of the total of photons in the light that is effectively used by the average plant (since the plant might not take 100 % of the photons at the frequency where its relative sensitivity is 100 %). The energy in the spectrum of the light of the lamp can be evaluated by the spectral sensitivity of the eye of chicken (N.B. Prescott and C.M. Wathes, 1999 and J. E. Saunders, J. R. Jarvis and C. M. Wathes, 2008). The spectrum of the light, multiplied by the spectral sensitivity of the human eye and the eye of a chicken. Luminous flux [lm] 1645 The light of the lamp evaluated for a human eye. Luminous flux chicken [cLm] 2831 The light of the lamp evaluated for the eye of a chicken. Factor from lux to cLux 1.72 With this factor, the lux value of this light can be converted to the cLux value. 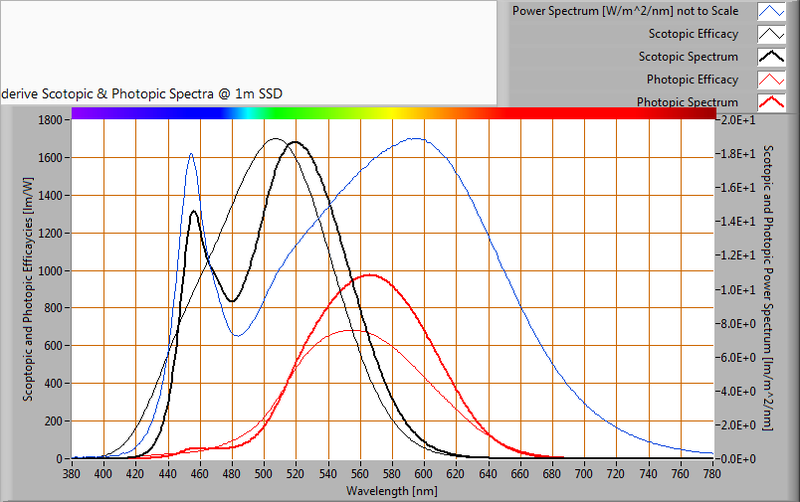 The power spectrum, sensitivity curves and resulting scotopic and photopic spectra (spectra energy content defined at 1 m distance). The S/P ratio of the light coming from this lamp is 1.7. The chromaticity space and the position of the lamp’s color coordinates in it. The point of the light in this diagram is inside the area indicated with class A. The areas A and B indicate areas for signal lamps. The color coordinates are x=0.3847 and y=0.3872. 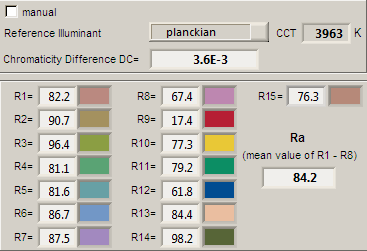 Each color has an index Rx, and the first 8 indexes (R1 .. R8) are averaged to compute the Ra which is equivalent to the CRI. CRI of the light of this lightbulb. This value of 84 indicates how well the light of this lamp can render well a set of reference colors, this in comparison with the light of a reference source (for color temperatures < 5000K a black radiator is used as reference and for color temperatures > 5000K the sun or the light outside during the day). The value of 84 is bigger than the value of 80 that is considered as a minimum for working areas in general. Note: the chromaticity difference is 0.0036 and indicates the distance to the Planckian Locus. There is a value mentioned of max 5.4E-3 in section 5.3 of CIE 13.3-1995 however no further explanation of it. An other reference with signal lights as a reference is given in the chromaticity diagram. TM-30-15 is an improved indicator (over CRI) of how well colors are rendered. TM30-15 Rf = 83, Rg = 93. TM-30-15-values for 99 samples for the light of this light bulb. The closer the value for a testcolor comes to 100, the more its rendition resembles that of a reference lightsource. 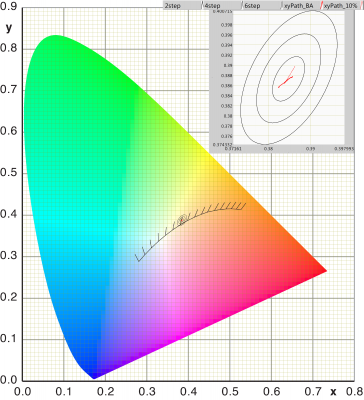 Graphical view of averaged color points for this light bulb compared to a reference source with the same color temperature. The melanopic effect shows the level of impact the light of this lamp can have on the day-night rhythm of human beings (as well as the suppression of melatonin production). The circadian stimulus indicates the degree of influence that the light of this lamp has on the human circadian rhythm. In addition to the melanopic effect of Ganglion cells, the contributions of S-cones and rods are also included. A CS value of 0.1 has hardly any effect and a value > 0.3 has an effect (0.7 is the maximum, saturated, value). 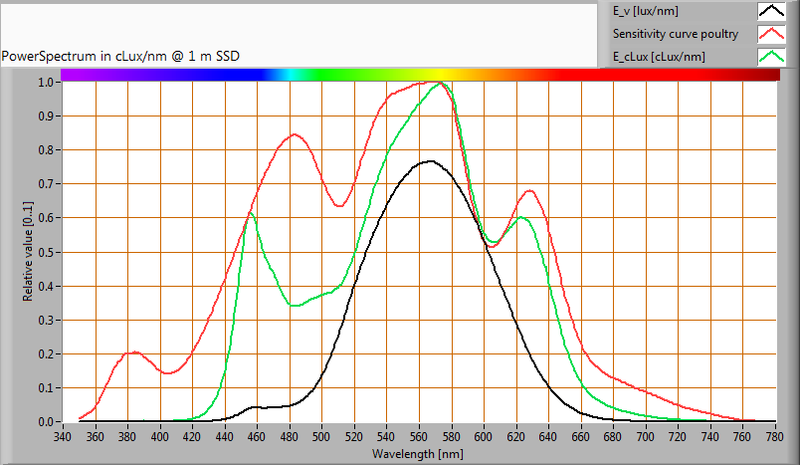 The CS value depends on the spectrum of the light and also on the amount of it (received on the eye). The amount of blue light and the harm it can cause on the retina has been determined. Herewith the results. 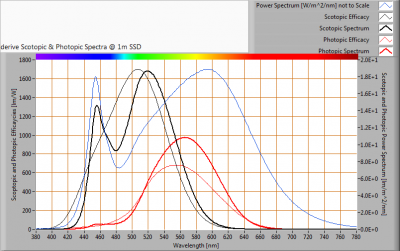 The level of blue light of this lamp related to the exposure limit and the different classification areas. L_lum0 [mm] 75 Dimension of brightest part of lamp in C0-C180 direction. L_lum90 [mm] 75 Dimension of brightest part of lamp in C90-C270 direction. SSD_500lx [mm] 1915 Calculated distance where Ev = 500 lux. This computation is valid when it is in the far field of the lamp. Note: if this value 200 mm then the distance of 200 mm is taken as proposed in the norm IEC 62471:2006. Start of far field [mm] 530 Minimum distance at which the lamp can be seen as apoint source. In this area the Ev is linearly dependent from (1/distance)2. 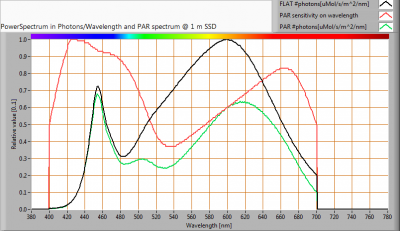 300-350 nm values stuffed with 0s yes In the event OliNo has measured with a SpB1211 spectrometer without UV option then the irradiance data of 300-349 nm is missing. For lamps where there is already no energy content near 350 nm, the values 300-349 can also be set at zero then. alphaC0-C180 [rad] 0.100 (Apparent) source angle in C0-C180 direction. alphaC90-C270 [rad] 0.100 (Apparent) source angle in C90-C270 direction. alphaAVG [rad] 0.100 Average (apparent) source angle. If average >= 0.011 rad then the exposure limit is computed with radiance Lb. Otherwise with irradiance Eb. Exposure value [W/m^2/sr] 2.95E+1 Blue Light Hazard value for this lamp, measured straight underneath the lamp. Computation is referenced to Lb. 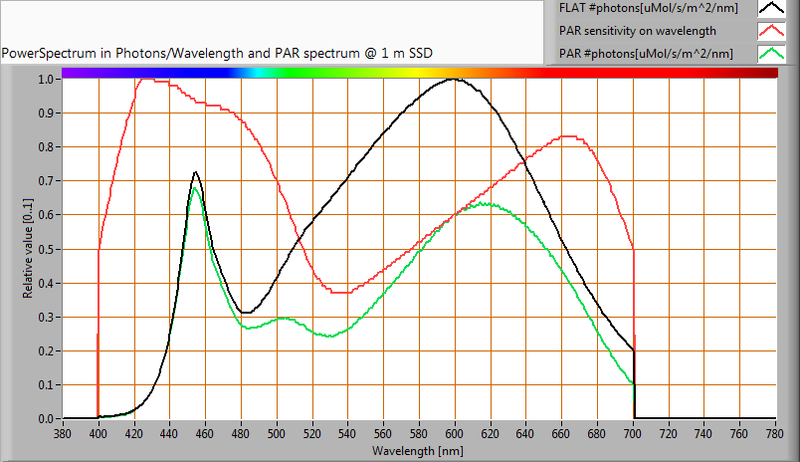 The exposure value of the Sunlike LED in the same spot type is 3.59E+1 W/m^2/sr. So the Blue Light Hazard for both spots are in the Risk Group 0. However the Sunlike LED has a higher exposure value than this spot with regular blue LED with phosphor. 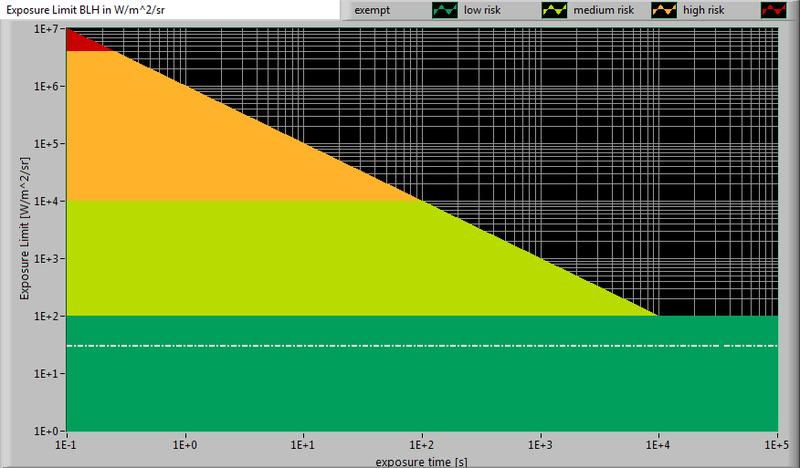 Blue Light Hazard risk group 0 0=exempt, 1=low, 2 = moderate, 3=high risk.